Thickness dependency of the field emission of amorphous and nanostructured carbon thin films has been studied. It is found that in amorphous and carbon films with nanometer-sized sp2 clusters, the emission does not depend on the film thickness. This further proves that the emission happens from the surface sp2 sites due to large enhancement of electric field on these sites. However, in the case of carbon films with nanocrystals of preferred orientation, the emission strongly depends on the film thickness. sp2-bonded nanocrystals have higher aspect ratio in thicker films which in turn results in higher field enhancement and hence easier electron emission. Field emission (FE) from amorphous and nanostructured carbon thin films is widely studied in the past few years [1–7]. Understanding the emission mechanism and reducing the threshold field at which the emission occurs (Fth) are the main two subjects of interest. Amorphous carbon (a-C) films are formed from carbon atoms of sp2 and sp3 hybridization . Mechanical and physical properties of a-C films strongly depend on the sp2 percentage as well as the presence and size of sp2 (sub) nanoclusters embedded in sp3 matrix. Different field enhancement mechanisms have been proposed for easy electron emission from carbon thin films. Robertson found that for different types of carbon films (hydrogenated, nitrogenated, etc. ), there is an optimum sp2 cluster size at which the emission occurs at the lowest possible Fth. Based on this observation, Carey et al. have proposed that the large field enhancement of carbon films is mainly due to the presence and distribution of conductive sp2 nanoclusters embedded in insulative sp3 matrix. The presence of a conductive sphere embedded in an insulating matrix leads to small field enhancement. However, the presence of two or more such spheres can further increase the enhancement; for instance, the field enhancement of two conductive spheres in the bispherical coordination system was studied, and it was found that the presence of two gold spheres which are placed 5 nm apart from each other results in enhancements of 56 which can be increased to 400 for a 1-nm separation . Based on this theory, the emission only occurs from the surface clusters and hence is independent of the thickness. Despite the above-mentioned theory, Forrest et al. studied the effect of different parameters including film thickness on FE of pure, nitrogenated, and hydrogenated a-C thin films. They found an optimum thickness for the lowest Fth in hydrogenated and nitrogenated carbon films. Since there is no correlation between the surface microstructure and the film thickness, this finding is obviously in contradiction with the mechanism proposed by Carey et al. . The only mechanism which can be used to describe the thickness dependency of FE is space-charge interlayer-induced band bending for semiconductors . Carrier depletion across the film thickness results in field enhancement at the Si/C interface; therefore, the electrons will be emitted from the conduction band of the silicon substrate to highly curved conduction band of the film. At very thin samples, although emitted electrons possess very high energies, they still cannot overcome the emission barrier (the work function of the film). At very thick films, on the other hand, the electrons will lose energy while they are passing the film, and hence they cannot overcome the emission barrier. Therefore, there is an optimum film thickness at which the emission occurs at the lowest possible field. In another study, Zhao et al. studied the thickness dependency of FE of a-C films. It was found that for a pure a-C film deposited at 200-V substrate bias, the Fth does not strongly depend on the film thickness. By challenging the space-charge interlayer-induced band bending model proposed by Forrest, they suggest that the F-N tunneling theory is the most suitable model to describe the emission from a-C films. More recently, the formation of preferred orientation [12–15] and the effect of this texture on properties of carbon films [16–18] attract lots of theoretical and experimental attentions. In our previous work, we have shown that the formation of preferred orientation in the microstructure of the film results in an abrupt decrease in the Fth. It was discussed that the formation of conductive sp2 channels throughout the thickness of the film results in the formation of high-aspect-ratio filaments which enhances the local field significantly. In this paper, in order to reconfirm the mechanisms mentioned above, the thickness dependency of FE in amorphous (with different bonding structures) carbon films with sp2-bonded (sub) nanocrystals has been studied. Besides, the thickness dependency of carbon films with nanocrystals of preferred orientation has been studied. Filtered cathodic vacuum arc  was used to prepare different types of amorphous and nanocrystalline carbon films. Bonding structure of the films was controlled through controlling the negative substrate bias during the deposition. In order to fabricate carbon thin films with nanocrystals of preferred orientation, a carbon film deposited at 300-V substrate bias was irradiated by a single pulse of a 248-nm excimer laser with a pulse width of 23 ns. The laser energy was kept at 460 mJ/cm2. FE was tested in a parallel plate configuration with an indium tin oxide-coated glass as the cathode with an anode-cathode spacing of 100 μm in a pressure lower than 5 × 10−6 Torr. In order to check the repeatability of the data, two samples were prepared at each condition. FE tests have been done on two different positions of every individual sample. More than ten measurements have been done on each test spot. where C λ / is 0.0055 for the 514-nm laser which was used in this study. As it can be observed, similar to previous purely amorphous films, there is still no correlation between the film thickness and Fth. Moreover, the presence of sp2 nanoclusters results in the reduction of average Fth to 10 to 11 V/μm. Thickness dependency of field emission and Raman spectra of carbon films. Deposited at (A, B) 100, (C, D) 1,000, and (E, F) 2,000 V.
Figure 2 shows the high-resolution transmission electron microscope (HRTEM) image of the carbon film deposited at 300-V substrate bias and irradiated by a single pulse of 460-mJ/cm2 excimer laser. As it can be observed from the HRTEM image and the respective diffraction pattern, (002) graphitic basal planes are oriented perpendicular to the substrate. The formation and propagation of preferred orientation in the microstructure of the carbon films can be explained using the high internal stress and also the anisotropic nature of graphite crystal structure. McKenzie and Bilek  have shown that during the graphitization of a-C films, the system possesses its lowest free energy (and hence the most stable phase) when the basal planes are oriented in the direction perpendicular to the stress plane (in this case, the growth plane). 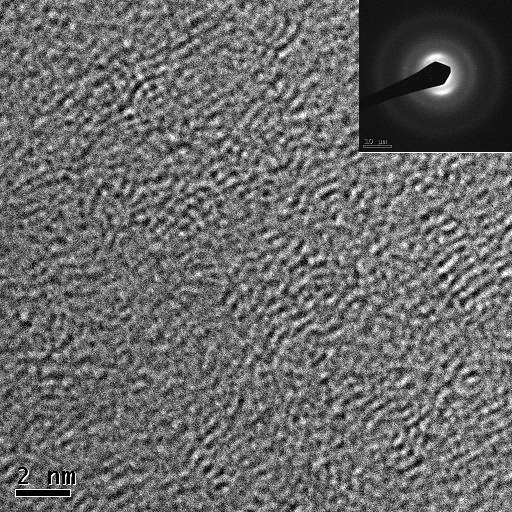 HRTEM images and the respective diffraction pattern (inset) of carbon films. Deposited at 300 V and irradiated by a 462.5-mJ/cm2 laser. Figure 3 shows the evolution of Fth of the 460-mJ/cm2 single pulse laser-irradiated carbon film as a function of film thickness. Despite the amorphous films, there is a direct relation between the film thickness and the Fth. Films of 25-nm thick show relatively high Fth of about 12 V/μm. Increasing the film thickness to 150 nm decreases the Fth to about 4 V/μm. Further increase in film thickness (250 nm) does not alter the emission threshold significantly. High-energy laser irradiation results in the formation of conductive channels throughout the thickness of the film which decreases the Fth through the formation of high-aspect-ratio filaments. Increasing the film thickness increases the aspect ratio of the filaments, and as it is shown in Figure 3A, the Fth decreases. The film shows its lowest Fth at about 150 nm. However, further increase in film thickness does not affect the Fth noticeably. This can be due to the fact that although the film thickness is increased, the average filament length and hence the aspect ratio is kept constant. This, in turn, is due to the non-homogeneity and non-continuity of conductive filaments throughout the thickness of the film. Thickness dependency of field emission and respective Raman spectra. 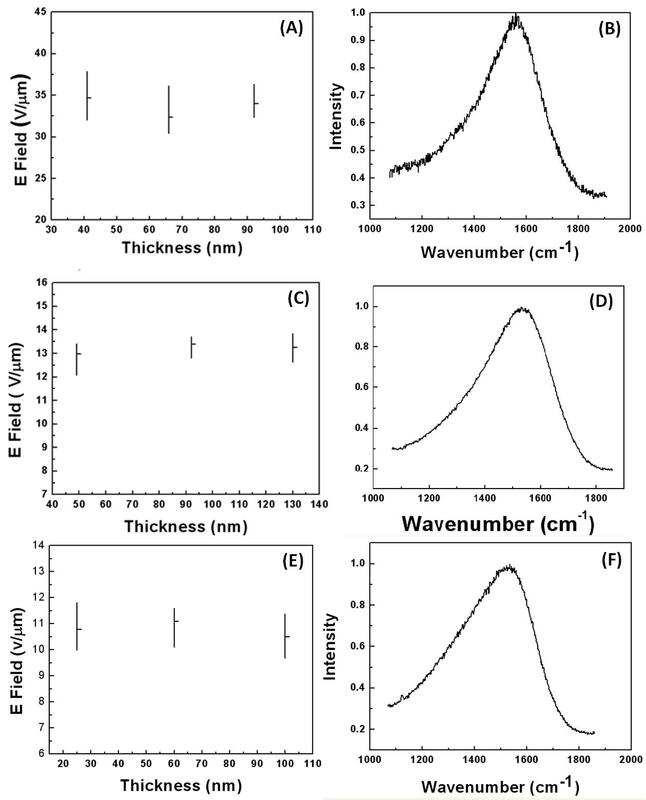 (A) Thickness dependency of field emission of carbon film irradiated by a single pulse of 460 mJ/cm2 and (B) respective Raman spectra of the film. Thickness dependency of the field emission of amorphous and nanostructured carbon thin films has been studied in this work. It was found that regardless of the bonding structure and clustering of sp2-bonded atoms, emission threshold field is independent of the film thickness. However, the field emission from carbon films with nanocrystals of preferred orientation strongly depends on the film thickness. Increasing the film thickness results in the increase in the aspect ratio of conductive sp2-bonded filaments and hence decreases the threshold field through increasing the enhancement factor. MS is currently working as a research scientist in the Data Storage Institute (DSI). He is studying the mechanical electrical and thermal properties of carbon thin films and nanostructures. EHTT is working as NTU-DSO postdoc fellow studying electrical mechanical and thermal properties of nanomaterials. TBK is a professor in the School of Electrical and Electronic Engineering, NTU. His team is working on the synthesis, characterization, and applications of nanomaterials and thin films. This work was supported by the Singapore Ministry of Education (MoE) grant no. T208B1204 (ARC13/08). MS and EHTT contributed on performing the experiments and writing the paper. Professor TBK contributed as the scientific advisor of the project upon performing the experiments. All authors read and approved the final manuscript.